ZeroCrypt ransomware uses sophisticated techniques to infiltrate computers and hide from its victims. Use Reimage to determine whether your system is infected and prevent the loss of your files. How destructive is ZeroCrypt virus? When did the malware infiltrate the PC? How quickly can I terminate ZeroCrypt? The latest week has presented a diverse variety of ransomware, and ZeroCrypt virus is one of them. This file-encrypting malware might not have consolidated its position among other similar threats yet, but there is much potential in it. It should not be taken lightly. This ransomware employs an elaborate RSA-1024 algorithm to encrypt important data. 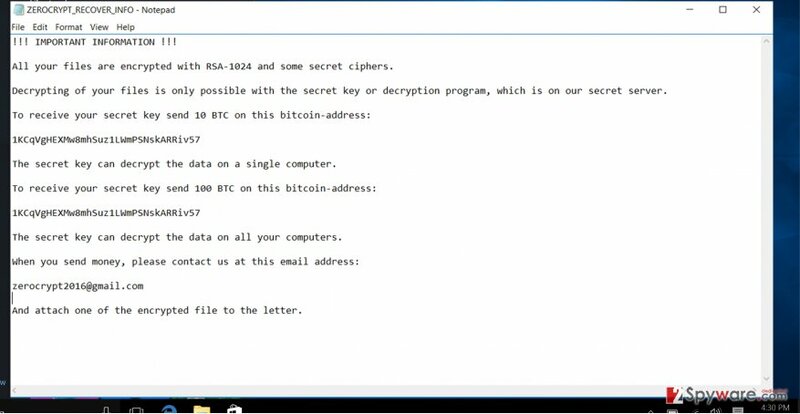 Perhaps, the most striking feature of this ransomware is that it demands 10 BTC! What is more, it offers an additional option to pay 100 BTC for the decrypter which is supposed to decode the data in several devices. It is naive to think that such greedy developers, who demand such stunning amount of money, will transfer the files. In fact, it might turn out more severe as you waste the money and fail to recover the data in the end. What we recommend is to initiate ZeroCrypt removal at once. Reimage is the tool which is specifically designed for confronting similar viruses. In comparison to other recently emerged file-encrypting viruses, the current threat seems to follow the original pattern of infamous Locky. Even the ransom message is written in the same manner. On the other hand, it requires a ridiculously enormous amount of ransom. Instead of remitting the payment, remove ZeroCrypt. You might be inclined to do that as the virus may not only decrypt as many important files as possible, but it is likely to create significant system vulnerabilities. After infecting the device, the virus searches for possibly important files and locks them with the mentioned encryption technique. The corrupted files now bear .zn2016 extension. Within seconds, the ransom message named ZEROCRYPT_RECOVER_INFO.txt opens. The developers instruct the victims to address them using zerocrypt2016@gmail.com. The latter seems to be an intriguing feature as the hackers use a legitimate email database for public use. The virus may be also related to CryptXXX or .crypt ransomware. The former rampaged on the virtual arena for a while and competed with IT professionals by continuously releasing new versions. It is likely that ZeroCrypt hijack occurred when you opened the infected email attachment. It is a common tendency for crooks to spread ransomware threats in such way. They mastered techniques how to convince users to open the desired extensions by presenting them in the form of fake financial reports, or invoice files. 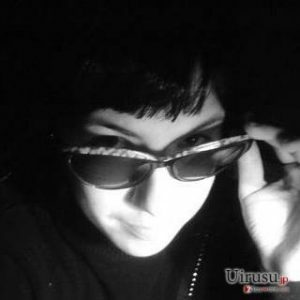 Zero Crypt 2016 malware may be disguised as a .doc, .dll or .js file. It is likely that the creators will shift to exploit kits which significant.ly accelerate the process of ransomware distribution. Proper security protection is one of the key aspects reducing the risk of a cyber assault. The most efficient way to eradicate ZeroCrypt virus would be to shift to automatic elimination option. For that, you will need to install a security program. Some of the options are Reimage and Plumbytes Anti-MalwareMalwarebytes Malwarebytes. Either of these applications will remove ZeroCrypt. However, keep in mind that the effectiveness of termination also depends whether the program was updated or not. After your device is cleaned from this threat, you may consider ways for recovering the files. On the final note, this ransomware might have blocked access to certain vital system functions. As a result, the process of ZeroCrypt removal might not go so smooth as planned. In that case, feel free to use our instructions to recover control to your computer. Log in to your infected account and start the browser. Download Reimage or other legitimate anti-spyware program. Update it before a full system scan and remove malicious files that belong to your ransomware and complete ZeroCrypt removal. When a new window shows up, click Next and select your restore point that is prior the infiltration of ZeroCrypt. After doing that, click Next. Once you restore your system to a previous date, download and scan your computer with Reimage and make sure that ZeroCrypt removal is performed successfully. Guide which is presented above is supposed to help you remove ZeroCrypt from your computer. To recover your encrypted files, we recommend using a detailed guide prepared by 2-spyware.com security experts. This tool is created for recovering missing and damaged files. It might come in handy retrieving the files encrypted by ZeroCrypt. Will Windows Previous Versions feature work? This utility helps you restore the previously automatically saved copy of each important file and image. It might require some time as you go through each document. If you did not have the habit of backing up your data, then this application might be your last hope. This application has been reported to decrypt the files affected by such serious virus as ODIN ransomware. This entry was posted on 2016-11-02 at 06:49 and is filed under Ransomware, Viruses. You can quickly scan the QR code with your mobile device and have ZeroCrypt ransomware virus manual removal instructions right in your pocket. How did you remove ZeroCrypt virus?